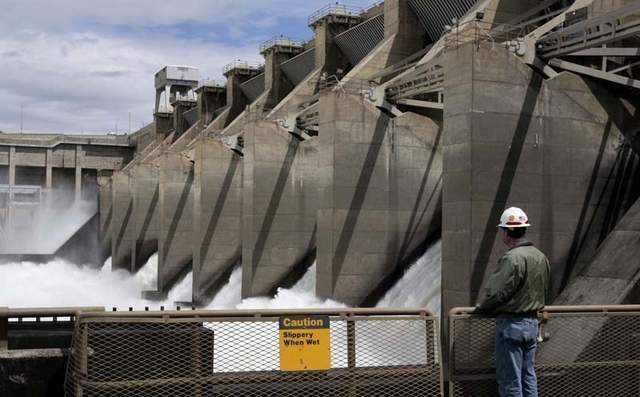 Officials from the U.S. Army Corps of Engineers say its most recent data shows that federal dam operations are already beating juvenile fish-passage criteria included as goals of a controversial spill proposal. That information was shared with the region's independent science panel Jan. 17 at a meeting in Portland, where federal action-agency officials briefed the Independent Scientific Advisory Board on the proposal to boost spill levels throughout the hydro system. Supporters say the 10-year "test" could increase adult returns to recovery levels, reaching smolt-to-adult returns (SARs) in the 4-percent range. The state of Oregon, the Nez Perce Tribe, the Pacific Fishery Management Council and several conservation groups have recommended adding the spill test to the Columbia River Basin's fish and wildlife program, currently being amended by the Northwest Power and Conservation Council. They point to a controversial analysis by some state, tribal and U.S. Fish and Wildlife Service scientists involved in the Comparative Survival Study (CSS) process that concluded fish returns would improve significantly if spring spill levels at federal dams in the lower Snake and Columbia rivers were allowed to rise enough for total dissolved gas levels to reach 125 percent in dam tailraces. Current levels are capped at 120 percent. The CSS spill team briefed the ISAB on its spill proposal in November. In December, the Council sent the ISAB a series of questions regarding the spill proposal, and this latest meeting was arranged to hear from federal action agencies on the topic. Corps officials showed data from recent performance testing at federal dams that estimated more than 60 percent of juvenile spring chinook pass each of the eight projects from Lower Granite Dam to Bonneville Dam by spillway or surface passage routes. The numbers range from 64 percent at John Day to 83 percent at The Dalles. For steelhead, from 56 percent at Little Goose to 89 percent at The Dalles are estimated to pass the dams via spillways or surface weirs. The Corps' data shows the dams are passing more fish with less volume of water than previously thought, nearly a 2:1 ratio in most cases. It's a point disputed by the spill proponents, whose own CSS analysis still maintains that fish passage and water volume follow a 1:1 proportion, an assumption nearly everyone accepted in the 1990s before extensive dam modifications began. According to results from the 2013 CSS workshop, the juvenile survival model used by spill proponents indicates spill levels of 55 to 65 percent "may" achieve 85-percent juvenile in-river survival over a range of flow conditions, which would achieve a 4-percent SAR, putting it firmly in recovery range. That's why the CSS proposal calls for increasing spill to 125 percent TDG or gas caps, which is the level they have estimated is needed to get 60 percent or so of the fish over the spillways. The new BiOp also notes more fish pass the dams via surface weirs with less volume, and that by increasing overall spill, juvenile survival could easily suffer because surface weir survival is higher than spillway survival. Higher spill could also reduce the ability of adult fish to pass the dams and affect their survival. There is already some evidence this has occurred in recent years, as spill levels were boosted by court order. The action agencies also said such a spill test would confound their current 10-year program--half completed--that is developing performance standards, and measuring in-river and reach survivals. "This program of research-based improvements and rigorous testing is demonstrating positive results and should be completed as planned," they said. They also cited recent NOAA Fisheries research that found ocean conditions are by far the most important factor correlating to adult returns, compared to in-river factors such as flow, which includes spill. And they noted that the spill proposal's survival gains are based on extrapolations, not data, because there is little information on fish survival at TDG levels of 125 percent. University of Washington statistician and BPA consultant John Skalski was also on hand to brief the ISAB on his review of the spill proposal, which had already pointed out many flaws from an experimental point of view. He told the group the current spill proposal is "too simplified" because there is no hypothesis to formally test, no error control, and wouldn't occur over a long enough time frame to tease out any results. Using SARs to measure benefits, Skalski said, would take more than 100 years of data-gathering before any statistically significant results could be achieved. If another measure was used, like comparing the return rates of transported versus non-transported fish, he said it would still take several decades to tease out potential benefits of spill from other factors like fish condition, ocean productivity and harvest. Skalski said his preliminary calculations suggested that in-river survival would have to increase "substantially"--30 percent or better--for the study to have reasonable statistical power in 10 years. Skalski also said the proposal is too open-ended, with no formal, peer-reviewed design and analysis plan in place. He noted an old spill-testing regimen that began years ago at Ice Harbor Dam is still in place because no formal conditions were implemented to terminate the study, and there was no consensus of benefits. He called it a "ghost experiment," and said it is still being implemented every year at the dam, with alternating two-day periods of 30-percent and 40-percent spill. As for the CSS spill proposal, Skalski said any study this costly with major implications to hydro operations and fish recovery needs to be designed to produce objective and convincing data that managers can use in an adaptive-management framework. Cost was not discussed, but knowledgeable sources say that the CSS spill proposal, if implemented, would cost BPA about $110 million a year, more than 45 percent of the agency's current annual F&W budget. It also reportedly could raise wholesale power rates 8 percent, and make it harder to integrate wind generation into the power grid.